The minor is comprised of two required courses, one encompassing technical aspects and the other the business side of energy. In addition, three electives are selected from offerings across the University. A final one-credit capstone requirement may be met through participation in an energy-related seminar offered by the Center for Social Concerns or by participating in a formal capstone class. The class brings together students from a variety of majors and gives them the opportunity to explore topics in energy research, policy, and business. Below are the projects presented in the Spring Semester 2016. Adam Conrath shared his experience as a participant in The GREEN Program in Iceland over spring break. Marc Gazda presented his evaluation of buildings in downtown South Bend based on energy efficiencies. Kenneth Obendorf researched Notre Dame’s role in improving the use of solar paint as an option to solar panels in the future. Austin Collins examined whether buying locally grown food saved significant amounts of energy. Benjamin Brockman researched legal cases related to the Nuclear Waste Fund. Belinda Hyland spoke of her experience as an intern with an energy consulting firm in California’s deregulated energy environment. Christian Metzler experienced air pollution first hand on a trip to India and examined the problem in both India and China. Christopher DeGrave delved into the complications of dealing with the Northern Access Project that is putting a pipeline through his family’s property. Gracious Adegbite connected his work in his native Ghana with a forum on campus featuring Jeffrey Sachs and the United Nation’s Sustainable Development Goals. The Energy Studies Minor began in fall 2011 for undergraduate students in all majors. The minor is intended to prepare students to become successful leaders who understand the complexities of global energy challenges. Drawing from both technical and non-technical resources, these students will help advance our country and the world toward a more sustainable energy future. 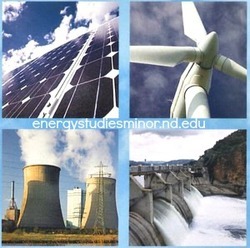 The Energy Studies Minor is administered by the Center for Sustainable Energy at Notre Dame (ND Energy) under the academic direction of Dr. Peter C. Burns, The Henry J. Massman Professor of Civil Engineering and Geological Sciences, Director of the Materials Science of Actinides Energy Frontier Research Center, and Director of ND Energy. For more information, contact Anne Berges Pillai, Education and Outreach Associate Program Director. Originally published by Barbara Villarosa at energy.nd.edu on May 05, 2016.